Mr. Walkup, Fix This Pothole! 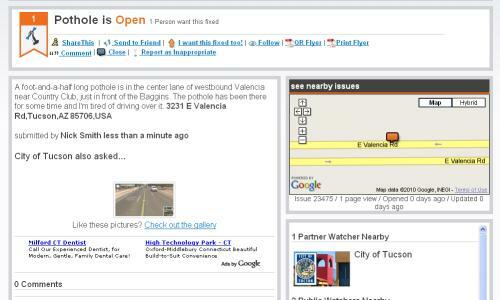 Last month, the city of Tucson rolled out a new feature that allows citizens to report annoying bumps in the road, graffiti and the like for city workers to clean up. By going to SeeClickFix.com, you can plot the blight on a Google Map, and the city will (in theory) patch the problem in a timely manner. People can even vote for what they’d like to see fixed the most. We decided to put it to the test. At 4 p.m. yesterday, we found such a pothole just outside our offices on Valencia Road, near Country Club, measuring about two feet by 8 inches. After taking some pictures, we posted a complaint on SeeClickFix. Now the ball’s in the city’s court. We’ll head out to site everyday at 4 o’clock to see how long it will take to fix this gash in the road. Keep checking The Range for any updates on Pot(hole) Watch 2010.